ASUS has now leaked the specifications for AMD's Ryzen 3 1200 CPU on their website. Read more on AMD's Ryzen 3 1200 CPU. 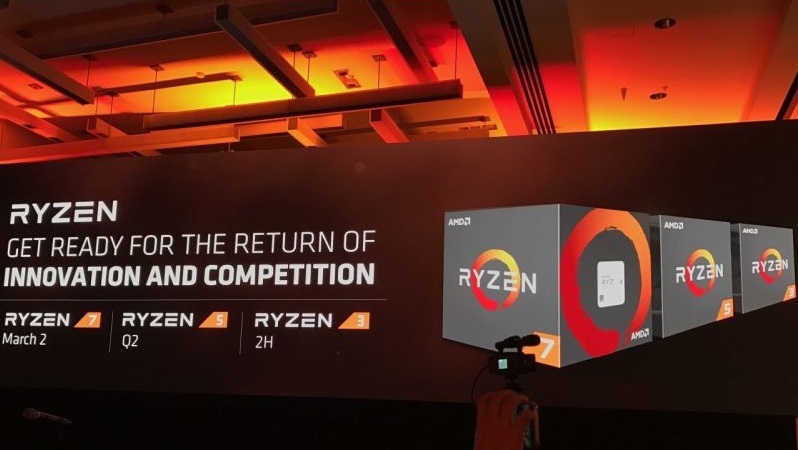 "It is expected that Ryzen 3 CPUs will be created from 4-core Ryzen APUs or other dedicated 4-core silicon, as the continued use of AMD's 8-core Ryzen silicon would be horrifically inefficient for the production of these low-cost products. " This seems to be a baseless statement that completely ignores the fact that even now 14nm dies and yields are far from perfect. A Ryzen 3 CPU using the Zeppelin die would generally only have slightly more defects than a Ryzen 5 CPU, and using these defected dies is far more economical than throwing them away. Ryzen 3 CPUs built on Ryzen APUs would need no defects in the CPU area at all, and would need an entirely different CCX layout from Ryzen 5 and therefore different handling in various pieces of software and firmware, and these parts aren't set to hit the desktop till 2018. While I'm sure there will be CPUs based on Ryzen APU dies, these almost certainly aren't them. This seems to be a baseless statement that completely ignores the fact that even now 14nm dies and yields are far from perfect. A Ryzen 3 CPU using the Zeppelin die would generally only have slightly more defects than a Ryzen 5 CPU, and using these defected dies is far more economical than throwing them away. Ryzen 3 CPUs built on Ryzen APUs would need no defects in the CPU area at all, and would need an entirely different CCX layout from Ryzen 5 and therefore different handling in various pieces of software and firmware, and these parts aren't set to hit the desktop till 2018. While I do agree that AMD should not be wasting partially faulty dies, it must be remembered that AMD had already stated that they want to release Ryzen APUs in the second half of 2017. Maybe it will not arrive on desktops on 2017, but remember that the mobile versions are typically just low-TDP versions of the same die. AMD has not spoken much about APUs yet, though it is expected that we will hear more soon as 2H 2017 approaches. Perhaps at AMD's upcoming financial analyst day. These are going to have to be pretty cheap. It's not just the I3s they are competing against, it's the excellent Kaby Pentium which only costs £60. Yeah, but a 4-core will easily beat those Kaby Pentiums, as the clocks are fairly low on those. The R5 1400 is £158 or so in the UK, so I expect the 1200 to cost around £30-40 less, perhaps £115-130. I also think that there will be a lower 1100 that will be around £100. These prices are just guesses, but I don't think that AMD will go far below i3 pricing. The clocks on the Pentium are low yeah, but they stand up very well against the I5 etc. I guess it's at that point where "it's enough". Thing is the clocks on the Ryzen will be pretty low too. Really hoping they actually go above 4ghz but if they don't there won't be an awful lot in it. Digital Foundry did an article about the Pentium and compared it to the Pentium Anni. Like me they noticed that two cores just stuttered all of the time in demanding games, where as the Pentium was butter smooth. And this is one area of the market where you can actually get a decent priced Intel board too. Yeah, but Ryzen 3 will offer overclocking, which Intel won't offer at these prices. The cheapest overclocker Intel has is the 7350K and it is a super overpriced dual core. It is Hyperthreading that makes the new Pentiums good, but 4 Ryzen cores that are overclocked to similar single-core speeds will be better in the long run. Shame Ryzen does not overclock a bit better, as otherwise this would be a home run for AMD in the low-budget market. AMD is effectively giving an i5-like SKU with i3 pricing. dual cores are not enough for gaming anymore, but how long will it be until a hyperthreaded dual core won't be enough? What worries me Mark is the fact that when you remove half of the cores they no longer retain the same IPC. I can't recall exactly what made that happen.. Cache maybe? but I think it was something else.